A popcorn bar is a perfect after school snack, movie night treat or slumber party main event. With a variety of popcorn flavors and cute containers, your DIY popcorn bar is sure to be a big hit with family and friends. 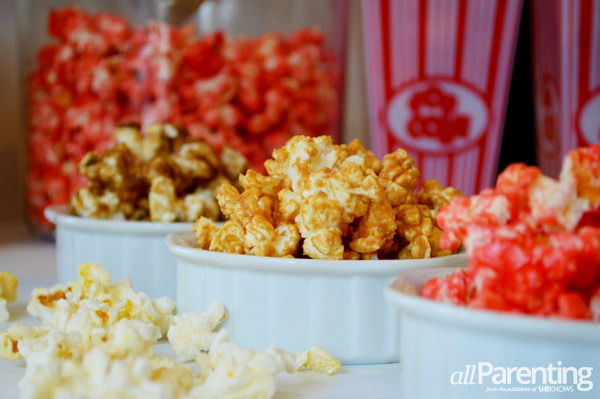 These popcorn bar ideas will get you started! Whether you're cozying up for a family movie night or hosting a fun gathering, birthday party or sleepover, we've got the perfect treat idea for you: a popcorn bar! 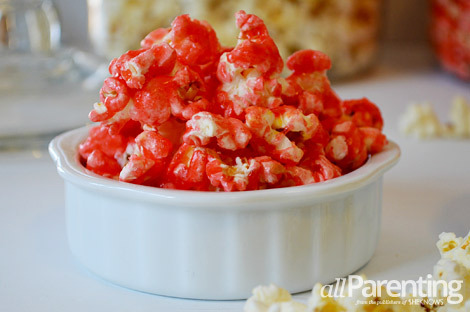 These simple tips and delicious recipes will make setting up your popcorn bar a breeze! And while your popcorn might not last long, it's sure to be a big hit! Cute popcorn containers. We love these paper popcorn bags as well as the plastic, reusable versions from Target. Large bowls for the popcorn. Use your favorite serving bowls or get creative with tin buckets, large Mason jars or even baskets. Plenty of water and napkins for munching guests. We like offering three kinds of popcorn at the bar. One idea is to make one plain version, one with a powder seasoning — cheddar is our favorite — and then try one of the scrumptious recipes below. Or, if you're feeling adventurous, try more than one! Each recipe starts with a bag of your favorite microwave popcorn and comes together in less than 10 minutes, but does need a little bit of time to cool and harden. Pour your popped popcorn onto approximately 2 feet of wax or parchment paper and remove any unpopped kernels. Mix thoroughly and pour the gooey deliciousness over your popped popcorn, stirring the popcorn thoroughly with a spatula. Spread the popcorn and let it cool, then transfer it into a big bowl to serve. Over medium heat, combine the butter and the honey in a saucepan until the butter melts. Consider pouring a tablespoon of vegetable oil into and right back out of your measuring spoon before measuring out the honey. This will keep your honey from sticking. Pour the hot strawberry goodness over the popped popcorn, stirring thoroughly with a spatula until the popcorn is covered. Pour 1 cup of vegetable oil into your measuring cup, then pour it back into the bottle. This will make measuring and pouring your peanut butter stick and mess free. In a pan, melt the peanut butter over low heat. This can also be done in the microwave, and will take approximately 1 minute for the peanut butter to melt smooth. 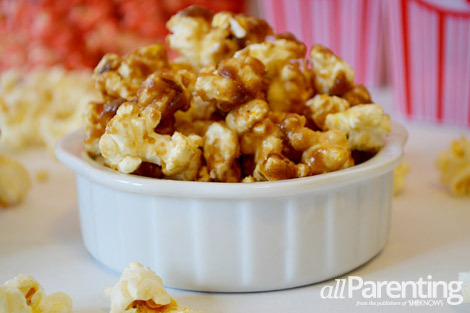 Pour the melted peanut butter over the popped popcorn that you've laid out on wax paper. 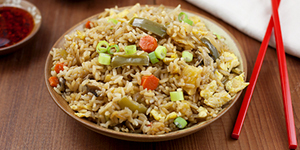 Mix up your flavor options with salty and sweet offerings. Also, consider using at least one simple recipe — plain, butter or a sprinkling of cinnamon sugar. All are well loved and quick to make. 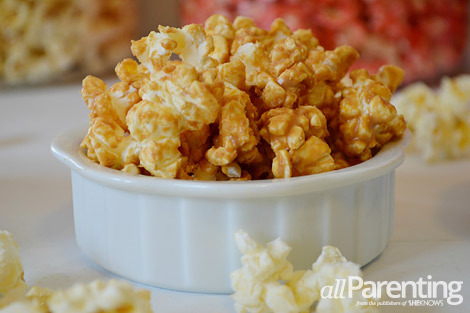 If you prefer making homemade popcorn, we love this Perfect Popcorn Recipe from Simple Recipes. And last, the initial pouring of the topping and stirring is too hot for little hands to help with, but once your flavored popcorn has cooled, your favorite helper will love breaking the popcorn into pieces, and of course — being your taste tester!